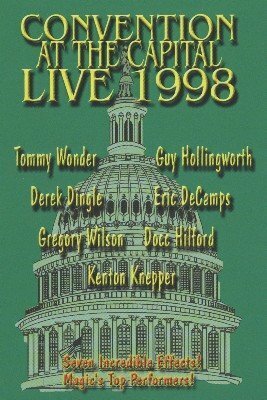 See the highlights of the 1998 Convention at the Capital. Seven top magicians sharing their pet secrets with you. Suitable for close-up and stand-up performance, each effect is performed before a live audience and then meticulously explained. Each of the seven effects can also be purchased individually as download. Gregory Wilson: Florida Keys : A baffling effect wherein two borrowed keys link and unlink from a key ring. Docc Hilford: Personal Touch : Learn how Docc Hilford flies first class when he only has coach tickets. A crash course in palm reading, spiced with magic. Guy Hollingworth: Waving the Aces : The aces visibly turn face up while at the fingertips. Eric DeCamps: Shadow Coins : A beautiful, compact routine wherein three coins vanish and then magically reappear, one coin at a time. Derek Dingle: Silver Quick : Classic Dingle. Four coins travel magically from the performer's hand to the spectator's hand. Brilliant routining from a master. Tommy Wonder: The Card in the Box : Critically hailed as the best "Card to Box" created. Tommy shares all of the intricate details of this powerful routine, including the incredible Two Second Card Fold.